Well a couple days after Christmas, I had enough, and a fight erupted over petty things between us and our extended family...I snapped ended up looking like a stark raving mad lunatic....but I don't care..(I do care that I couldn't say things with the love of Christ, I let my temper flare big time)...At least I think my point is across that I won't be walked on. We will have to agree to disagree...they have physically left, but are still cleaning out their stuff, and pets. Some are gone, but several still remain. In the long run in order to preserve any chance of a relationship it is best for us to not live together. The way we each prefer to live our lives is not compatible under the same roof. My husband is off this whole week. So we are working today to reclaim our house a little...but not overworking ourselves. Taking it nice and slow. We plan to give each of our kids their own room. I realize, it's hasn't been the easiest year. (I know others have had it alot worse) but between downsizing and relocating from Delaware....living with good friends....finding a place and having to downsize even more....just to move again because of circumstances involving water damage and a not so great landlord...then losing hubby's brother in a violent way....then allowing extended family to stay and all that has entailed....i need to cut us some slack. 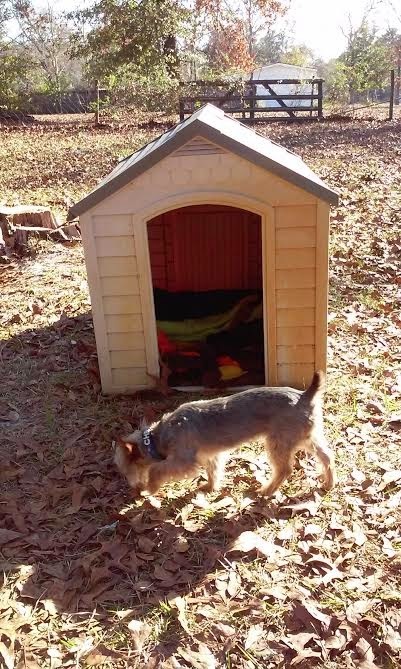 My house was called a pig sty several times this week...on social media and to my face so I have turned what was meant to hurt me into something laughable and loveable.....We are affectionately calling our home....Jimmy and Minna's Pig Sty. (Minna was a nickname I was given years ago by a small child who could not say my real name correctly) I intend to even make (or have made) a wooden sign to hang over the door eventually that says just that. 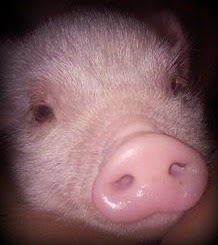 (I do actually have a pig now...she was a Christmas gift. We will see how big she gets to determine exactly what we will do with her. Now with the extra room we will have as family moves out we will make this house a home. I realized with all that happened, we never got a chance to do that completely. This thought process was triggered by me getting angry on Christmas day....he was in our room watching tv...I felt like we were not really spending time together...our daughter wanted a toy put together and he seemed grumpy about helping....so I snapped at him too...and I thought about it and was like I really don't want to be married anymore...I even told him that after family moved out I would just share a room with our daughter. I prayed that night alot....we did get past our angry moment after a few hours, but the next day I realized it isn't my husband that I don't want. It's that he is always tired (I guess from work.) I sometimes feel like a I am married but a single parent if that makes any sense at all. The next day when he went to work it dawned on me I just want him to be a more active part of our lives, and if his job is taking him so much out of him then maybe we need to pray about how to change. We will see where this journey and prayer takes us. I probably won't get another post in this week. Hubs and I are going on a date with money we got from Mom Mom and Pop Pop for Christmas. He is paying for lunch, I am taking him to a movie. We haven't been on a date since the summer. With everything going on I certainly have not attempted to have a date night at home either. Do you have any new plans on the horizon...anything special you are praying for. "SEE" you in the New Year!!!! 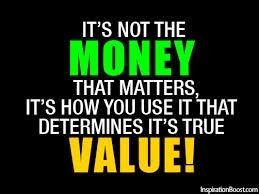 I think one of the hardest things about being frugal is any mocking or name calling people like to do. I recently discovered someone was calling us "trailer trash" and telling people if they want to aspire to be more they should hang out with people who have money....(instead of us apparently) Ok. That stung a little, but you know the person doesn't even personally know my family. To be told yeah you live but not well etc...etc. While the comments irritate me, it was just what I needed for the discontentment I was feeling to be obliterated. When I thought about it, I love learning new ways to be creative within what we have. So I guess I should tell them thank you for sharing their opinion. 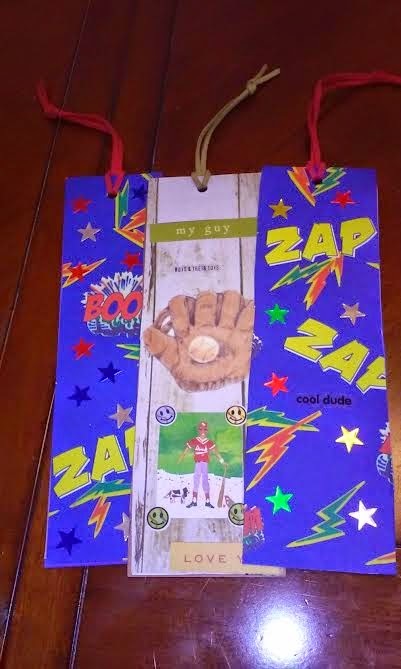 I made book marks using cereal boxes, scrapbook paper, and other craft supplies I already had on hand. 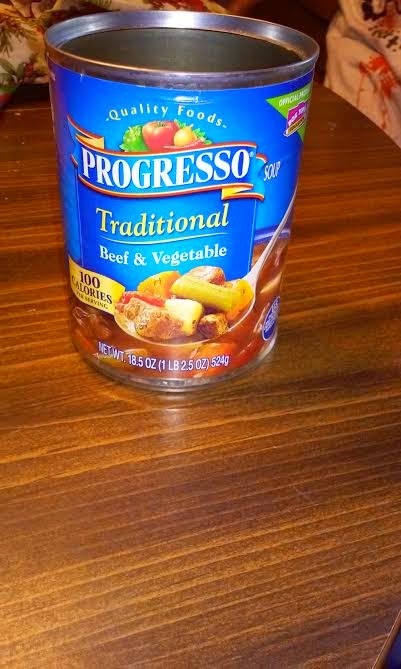 Saved left over veggies, gravies, and meatballs from meals and have put them in freezer for future use in soups. 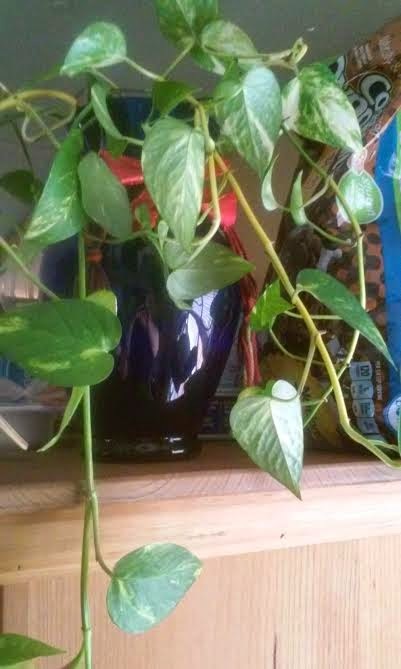 The church had some overgrown plants...I trimmed them and brought the clippings home to make a new plant. This will be my final post before Christmas comes, so from my household to yours...We wish you a very MERRY CHRISTMAS!!!!!!! 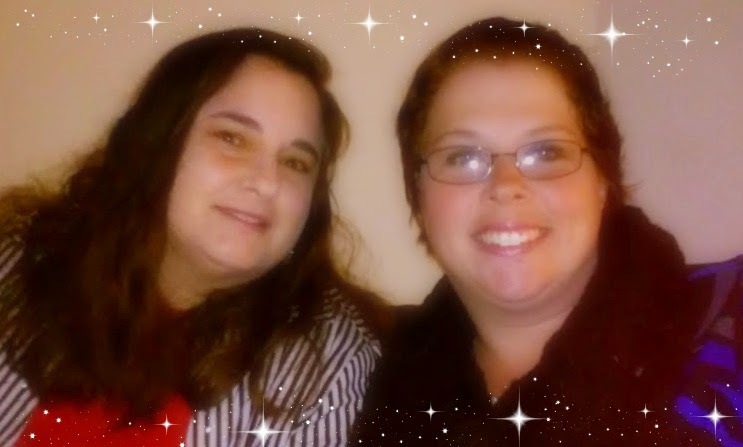 Well many of you have been such an encouragement to me as I have transitioned from the Grinch...to a happy mom, wife, and friend helping to prepare for Christmas. I wanted to share some simple things that we did to stretch our gift giving dollars. Some things didn't even cost money at all. On average we spent about $3.00 per gift that is being given out. We didn't spend alot, but we found things that each person will love. Simple can be effective! You can give someone something that you do not use. 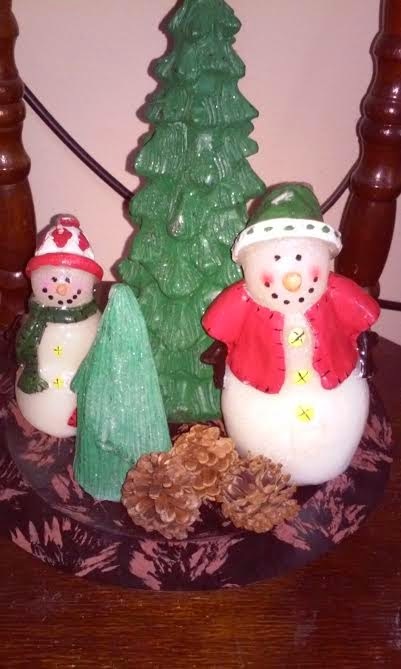 Examples are this little snowman set. This was Grandma Joan's and as Aunti L was going through her things. This was found still in plastic. She knew she would not use it, she offered it to us. 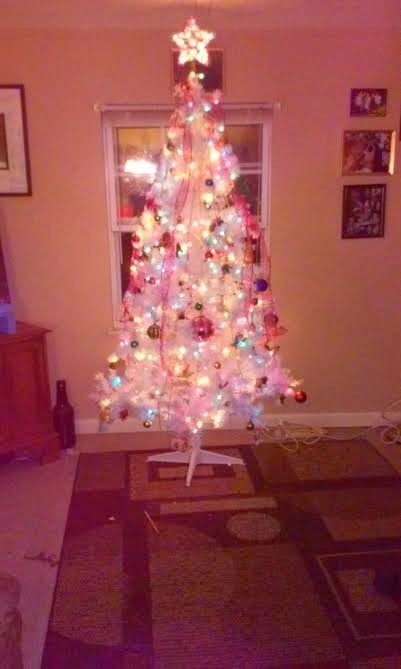 We happily added it to our Christmas decor. Another example is going through your purse or wallet stash...Do you have something you don't use, could you pass on something that is still in nice condition to a daughter, granddaughter, niece or son (my son love's to use my husband's old wallets) Also I gave my four year old little girl a wallet I don't use. She loves it. 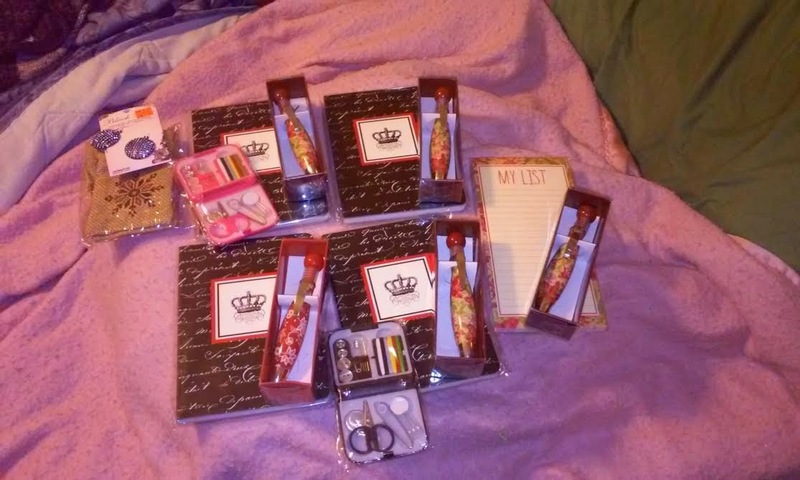 I purchased Journals and matching pens for $1.00 each and will add them to the Frozen jewelry I bought on ebay to make gifts for 4 of the girls in our house. We also found little tiny sewing kits for $1.00 that we will add to gifts for two children. (one is in a fashion class, one is in boy scouts) I also found a shopping list and will use one of the pens as a teacher gift for my son's teacher. I also found some pieces great for making earrings on clearance for $2.00 and will give those to my nephew's wife. 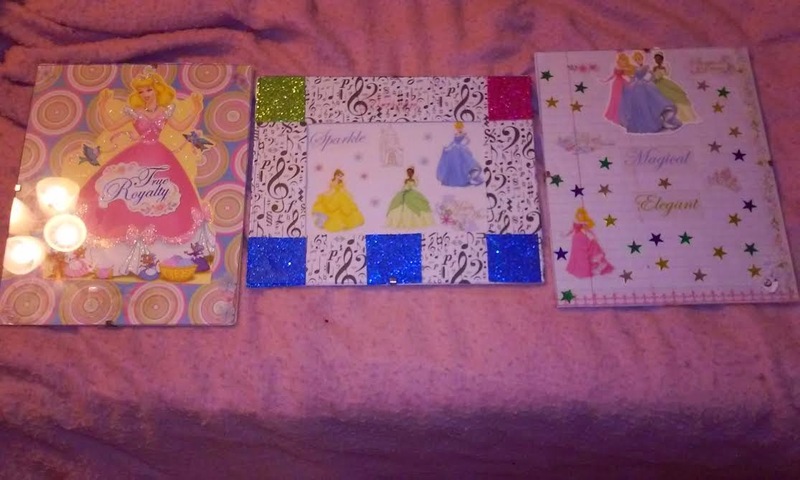 I also got some princess stickers on clearance for $3.00 and used them to add to and redo some of the pictures I got my daughter from the yard sales. The one on the end with note book paper has been designed to be a dry erase board type object for her. You can get dry erase markers and write on the glass of the frame and wipe it off. I found cologne for each guy in the house. (I got my husband the one that says Hot thrills.) 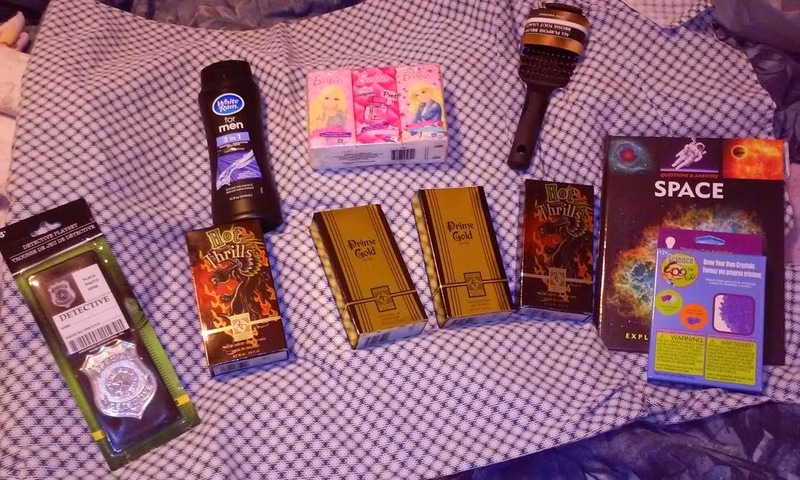 LOL For the 14 year old boy in the house we will combine some cologne, hairbrush, and men's shampoo for a simple gift. We also found some space and science themed kits and books to give to another boy we are close to. 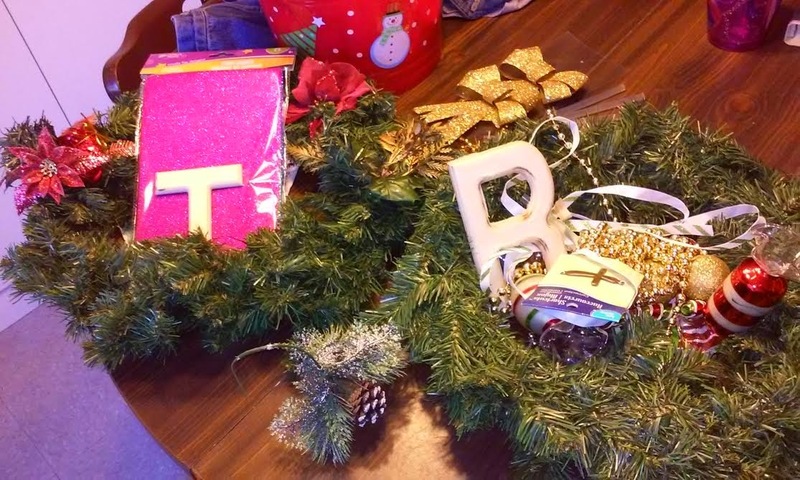 We made wreaths using things we had on hand with the exception of the letters purchased from Michaels, and the sparkly paper we covered them in came from the dollar tree. 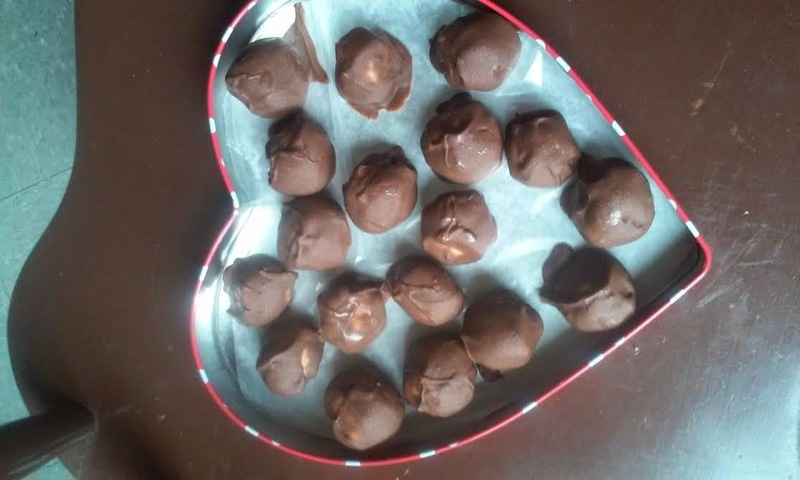 I made one for my house and one to give as a gift to my best friend. The wreaths I had gotten from someone throwing them away when I did my curbside picking several months ago. 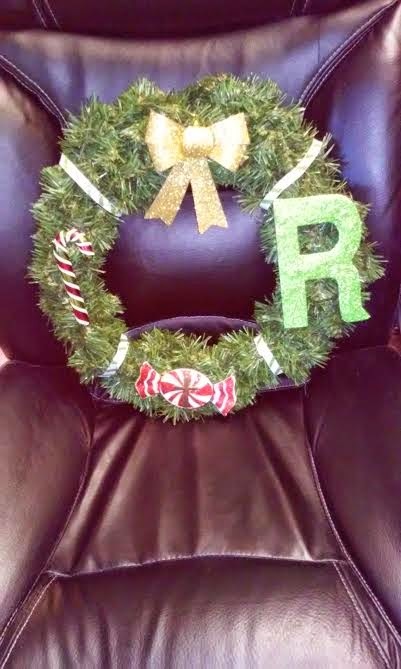 You don't have to have a wreath to make something like this though. You can cut a big circle out of cardboard and decorate. Your kids can help. 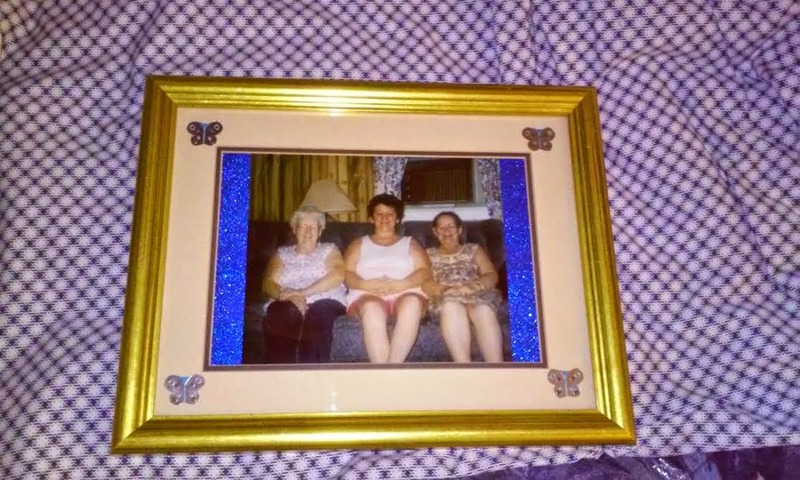 Aunti L loved the one we gave her. It is on her door! 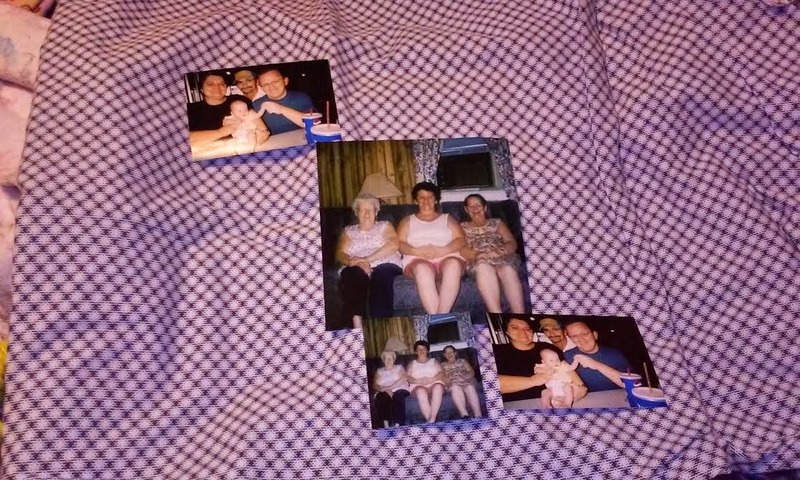 One year we did something like this, covered it with scrap book paper and family pictures and gave them as gifts. I also purchased two finger nail polishes and a bottle of nail polish remover to give as a gift for a girl. 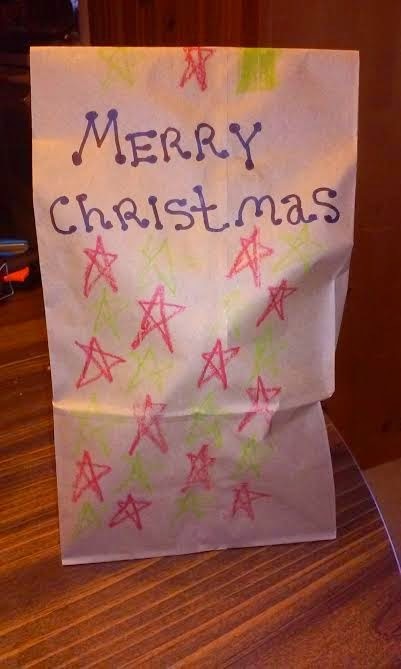 We handmade our gift bags out of paper sacks we had left from making home made microwave pop corn bags, and my kids colored them. We made book marks using cereal boxes, scrap and construction paper, yarn and glue sticks. 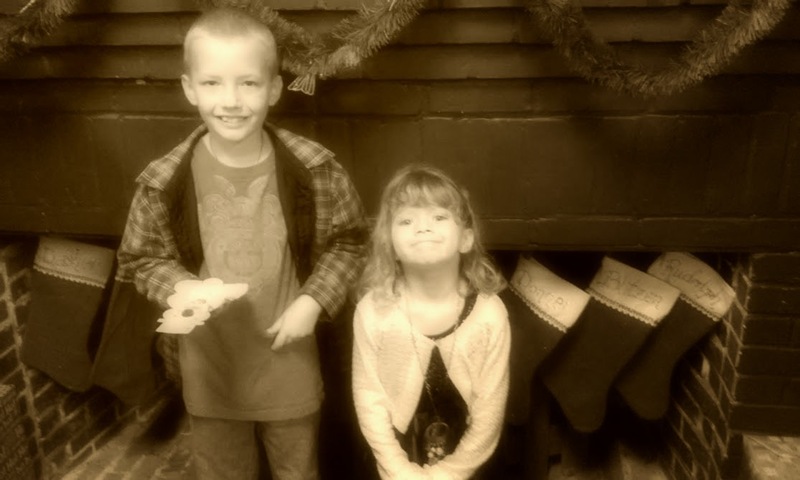 You could also give the gift of a special family photo. They don't cost much to reprint. I redid one of my husband's mother, and two grandmothers. They all have passed on now. I re-framed one for my husband and one for my nephew. (I found the frames at thrift stores) I dressed them up a little with craft stuff I had. ...maybe your mother, friend, aunt, dad, husband or wife could use the gift of your time to get a project done. Or maybe there is something they are unable to do for themselves that you could help with. On Saturday night, I was invited to a Ladies tea at church. It was nice to fellowship with ladies, and hear some share their testimony as well as the word of the Lord. By the end of the night I was feeling very convicted. I had to admit that my relationship with the Lord is just very broken. I gave in to the Holy Spirit and went to the prayer room that had been set up for ladies to privately pray with other ladies. (I do remember accepting Christ at a young age, however in growing up, I am not sure how much thought I gave that) My husband and I consider ourselves to have been Christians for over 10 years now. If I am honest though, I am not sure how different my relationship with Christ looks all these years later. I am not a strong and rooted woman of faith. I am probably just still a baby in spiritual appearance. That is not good. I confessed that I am not strong enough to be everything that is needed in my home. My husband has never been a strong spiritual leader in our home (no I am not bashing him just stating a truth) I know he has his own spiritual and heart struggles. The problem is, I don't know how to be the one who does all the "right" things while I wait for there to be change. What about times, that I stand for something that is right even against my own family. I don't know what direction I should be headed in with spiritual growth. My personal relationship with Christ, and it's growth or lack of cannot be placed on what my husband does or does not do. I admitted I am very broken, and at the end of myself. That in desperation I have been conformed to the world and done things that I shouldn't have to meet my families needs at various times over the years. I had forgotten God's promise in Philippians 4:19, "And my God will meet all your needs according to his glorious riches in Christ Jesus." 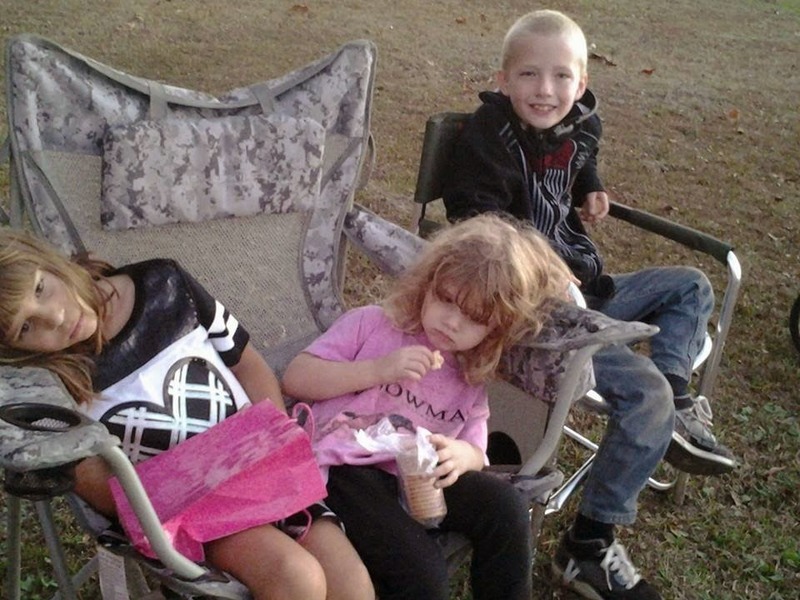 There were also times where I felt like my families needs just were not provided for. (Looking back the needs probably were met, I just couldn't see my blessings.) I couldn't remember the last time we had sat down as a family to really thank God for the meals he gives us each day. My security has been at times been in the amount of money I did or did not have in the bank. I am not strong enough to fulfill my husbands roll and my roll spiritually and physically in this house. I don't really know what my spiritual roll is I guess. Someone prayed very earnestly with me over my frustrations. We prayed for my husband. For the protection of my children from things they may have seen or heard. Over our situation with my nephew living with me....it is a tremendous strain and drain on everyone (for their family too) I had forgotten about taking my problems to the Lord and not just voicing them out loud to ears that would listen. We prayed that they would find a place, or that the Lord would give us abundant and overflowing love for them. There have been some serious overstepping of bounds and I want to address them in love, but I am also afraid because of past fights we have had, and things that have been said. It was a beautiful time. On the way home I apologized to my best friend (we rode together) and admitted that I have not been a very good friend. I don't offer to pray with her, and as her best friend and sister in Christ that should be one of our strongest bonds. I know God takes broken things and makes them new. I look forward to that renewal. I am excited to know that I can come to HIM just as I am, broken and hard hearted, and He takes me as I am. There is nothing I can hide. So my biggest savings this week is going to be preceded by a little, laughable what I call Life Unscripted moment that occurred last week. My son's bus stop is located at the end of our little dirt road. We could walk to it but the dirt here is very interesting. I am not sure if it is sand, or clay or what but it seems to really stick to anything it can, so I usually drive him so he stays clean, plus it has been cold anyway. Well early last week I just threw my bathrobe on over top of my night shirt put on flip flops and drove my son to the bus stop. I guess I forgot to turn the key off while we were sitting, so the lights on my car were running while the car engine was turned off. Can you guess what event this might trigger? That is right, my car wouldn't start. We only sat for five minutes maybe but my car would not start. The battery was D_E_A_D! that fast. I did remember to take my cell phone. I try my husband first, best friend second, and my nephew last. No answer from anyone at first, and I sure don't have a set of jumper cables. They went missing a couple months ago. I decide to sit there, I am not getting out of the car and walking up the dirt lane in my bathrobe for all the neighbors to see to get to my house. I call my insurance company only to find out the agent did not add the roadside assistance that I had requested be added to my policy. No help there. Finally my nephew responds ( I mean come on he lives with me) He does have jumper cables, and he comes and gives me a jump...while laughing at my bathrobe dilemma. Needless to say...MJ learned to get dressed before she takes her son to the bus stop each and every morning...NO EXCUSES!!! That being shared. My nephew looked at my battery and it had a 10/12 sticker on it. He said that sometimes batteries carry a warranty for five years or more that I might be able to get it replaced for free if I could figure out where it came from. I Googled the brand and found out that Advance Auto is the only retailer that carries it. While out doing my errands on Friday I finally stopped into Advance Auto. My battery did in fact give a reading that it needed to be replaced. It had a three year warranty, so I was in range to have it replaced. I had no receipt for purchasing the battery (I am not the one who purchased it anyway, it came with the car last year) The guy did a search in his computer, and it was clear by the date on the battery that it should still be under warranty. He made me a new receipt under my name, and replaced the battery for me for a savings of a whopping $168.99.!!! I feel really blessed, I had no idea that a battery had a warranty. That was not the only blessing I received this week. I got a surprise package in the mail from a wonderful reader and now have some beautiful pieces to add to my Christmas decor, and it definitely brightened my spirits. 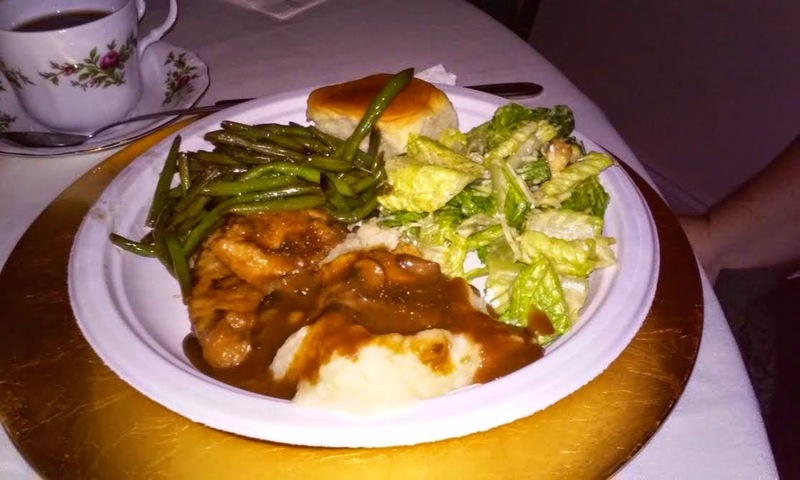 Saturday night I was blessed with a wonderful dinner for my body and a beautiful message for my spirit at a tea hosted by our local Calvary Chapel. It was for ladies, so I got to go out and fellowship with other ladies. It was very nice. I will be sharing more about the night later this week. 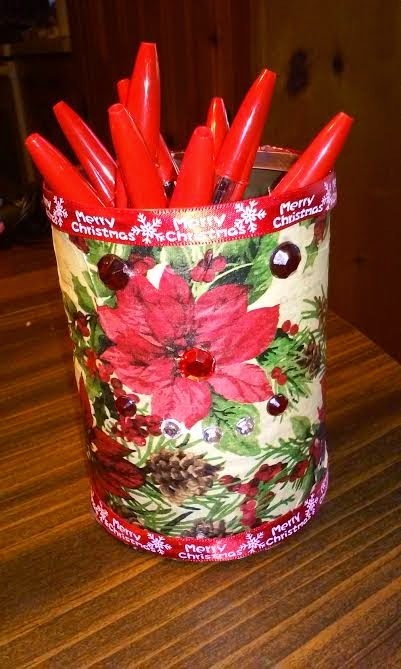 This week we have also been making a few things for Christmas to give as gifts. I will share about that later this week too. Do you have alot going on this week? I found Cuties on sale at Walmart for 3.50 a bag. They are usually six dollars. My 4 year old recently discovered she can peel these herself, and I would much rather her eat a piece of fruit then candy. Shopped a local book store that sells both new and used books and for 15.00 got a couple of nice gifts for my husband and son. There is a local church that hosts a thrift store on Thursdays and you can fill a bag for a dollar. 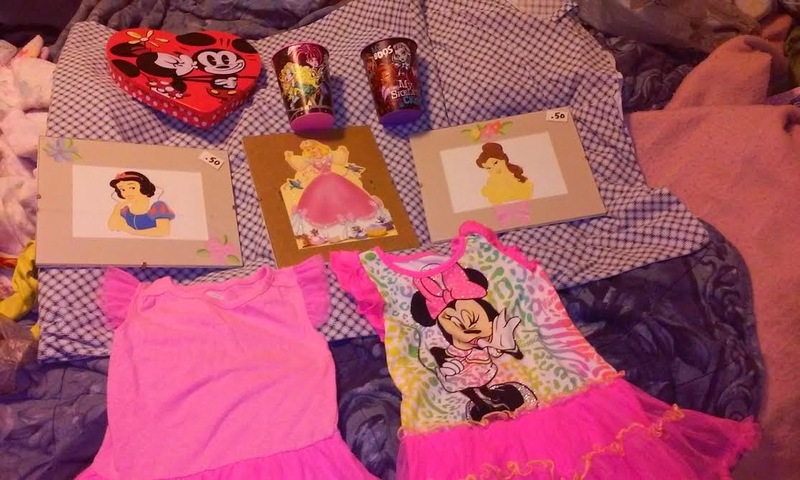 I got quite a bit for my daughter. A new bathing suit. A pair of boots, two dresses,pajamas and some other items. I also found a great vintage purse. Two of the dresses that I got for my daughter I will put away as Christmas gifts. I paid 2.00 for the lot. 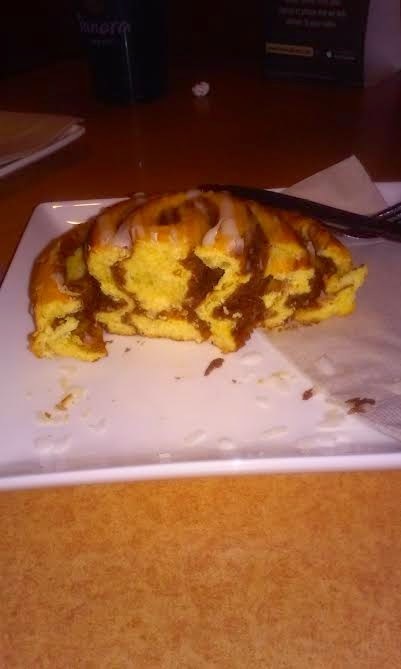 I redeemed my free birthday pastry from Panera. (If you have one of their cards, it is a free perk. For your birthday they give you a free surprise.) Turned it into coffee/shopping day with my bestie. We were looking for ideas for Christmas etc. I also am part of the Kellogg's reward program at https://www.kelloggsfamilyrewards.com because occasionally we buy pastry bars or cereal that include codes you can enter and earn points for. For my birthday they awarded me with a 20.00 credit to https://www.shutterfly.com/. 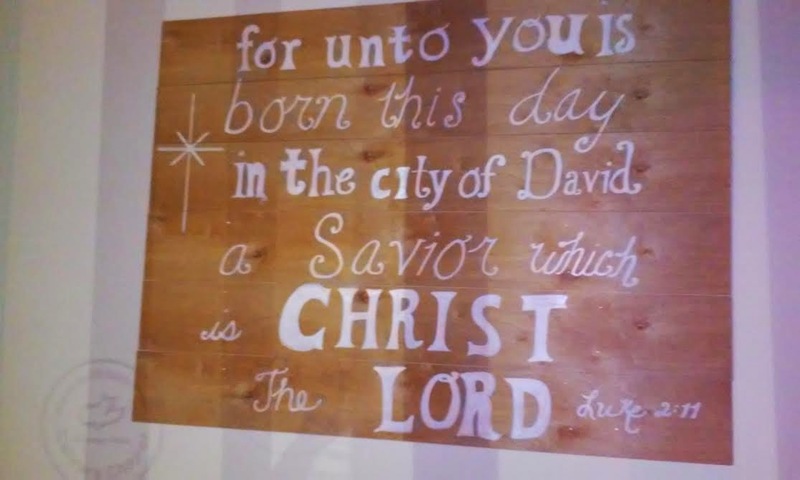 I used the credit to order Christmas cards, and some prints to finish some picture projects to decorate my walls around the house. I just had to pay shipping of $5.00. I visited a couple yard sales on Saturday, and got some stocking stuffers for 1.50. I also got a scrapbook, one of those ones that are done for you. You just have to add pictures. I picked up this one for my daughter. 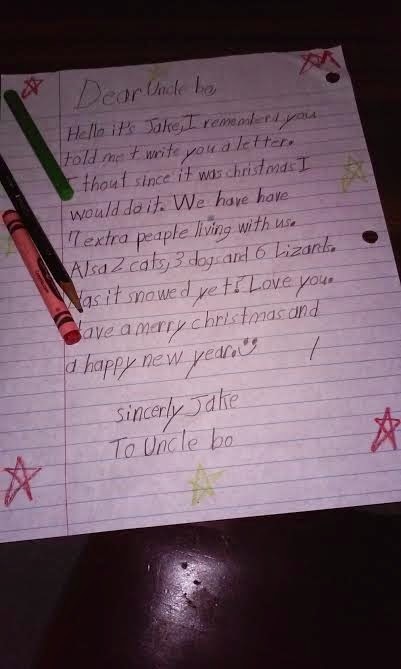 I know she is 4 but she never had one, and my son does. I thought it would be a nice project to work on for her that she will appreciate when she is older. I also took a look at our budget again. I was able to review some bills and remove some things that were not necessary, and I have decided to cancel my YMCA membership. These things will save us $90.00 per month. I hope some of this information helps someone. Thanks for following along or stopping by. Don't forget that everything you do, or don't do matters! I think my attitude comes from some Christmas past when I have been made to feel like my efforts to or for others are inferior. This year may be a bit of a challenge too with two families in one house with clearly different expectations. We usually keep Christmas small. 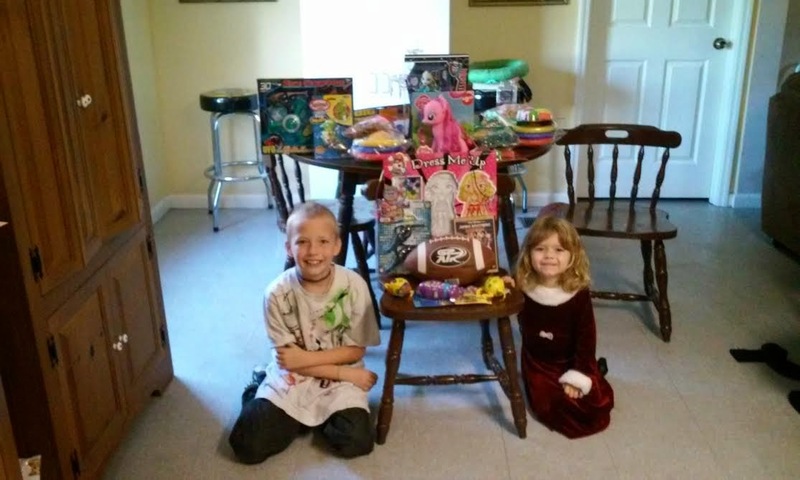 Three gifts each for the kids, and a stocking if funding allows. My nephew and his family if I understand what they are saying like a big Christmas because that is how they express their love for one another or something like that. This comes from issues from Christmas events in their childhood and not getting much or something like that. I also hate all the commercials that comes on that are all about consumerism trying to make people feel like they have to have all the great decorations in order for Christmas to be perfect ( i mean i know the point is to make you go out and buy things) and it is effective because it makes me wish I could decorate like that. 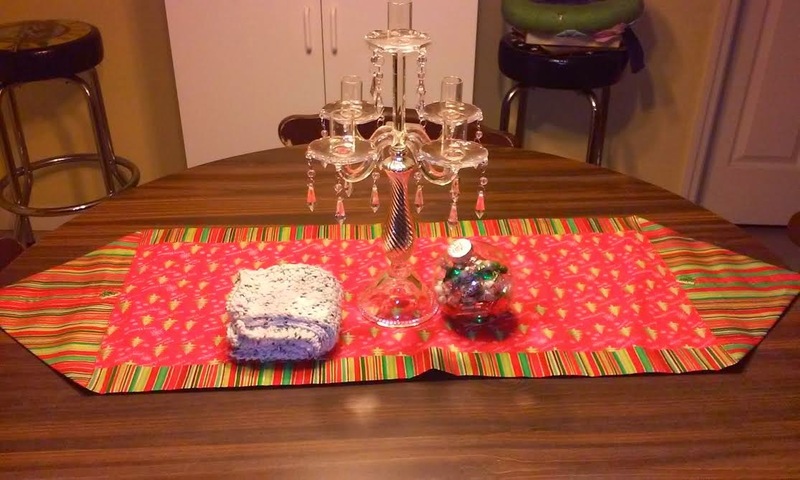 I have always wanted a big pretty tree skirt but I am not willing to pay retail for one...so it is what it is. We put it in front of the window. A favorite part of Christmas for me is the lights. 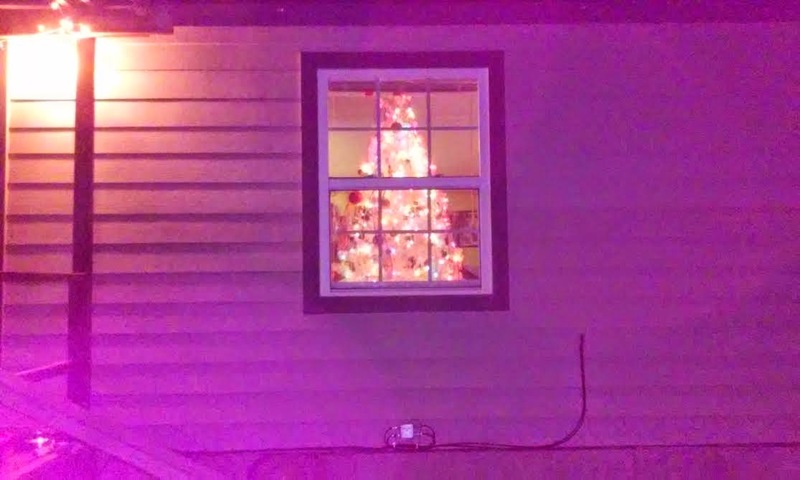 I love being able to see the lights on trees glowing in the window. I remember my grandparents taking me around neighborhoods as a child to look at lights when I went to their house on visitation after my mom died. We took our curtain down for now so ours could be seen. Though it may only be seen by us and the neighbors. My husband even hung a string of lights outside. It's not much, but it's perfect for us. I also spent alot of the week researching, finalizing ideas, and collecting some things to finish Christmas shopping. I also have some DIY projects in mind. Do you decorate for Christmas. What kind of tree do you use? I was recently told about a Jesse tree, and may look into doing that too, because we need something that will draw us back to the real reason for this season. What ways do you celebrate Jesus? I would love to hear your ideas. We have also had a talk with our nephew asking what his plans are in terms of moving out. I am not sure if I upset him, but i was dismayed to hear they have saved nothing yet. The increased child support payments have not started, and I encouraged him not to wait and depend on that money to move. There is a house next to us, that apparently will be available the first of the year. They may look into that. He is thinking of working overtime to help meet the monetary demands of moving out. I just told him our arrangement isn't working. Each family gets grumpy because of something the other one does or does not do. Did I mention that homeless things seem to just find us. This week we found this guy in our yard. We have plastered his face all over face book. Asked the neighbors if they are missing a dog....for now he is staying here. (I can hear you groaning saying what is wrong with you) I know I don't need another dog. 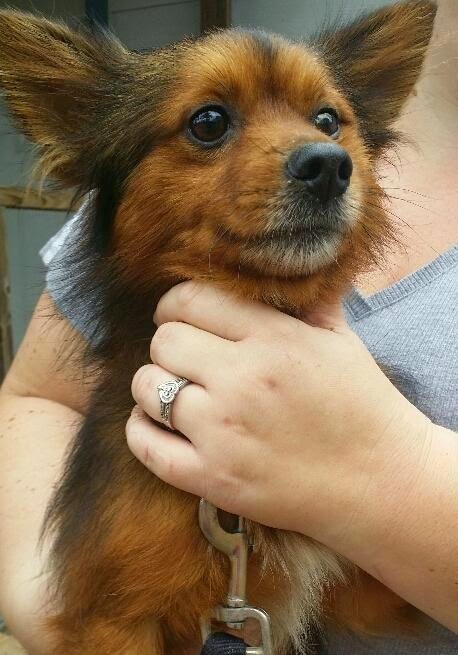 We are still waiting to see if an owner shows up. Tomorrow I am taking him to a local vet to check for a microchip. He is pretty smart. Seems to be housebroken. Acts like he lives here. We will see what happens. Did you have any surprises in your week? * Laundry detergent and homemade dog food were made in the house, as well as dry milk mixed with water to make regular milk. * I found really inexpensive jewelry on ebay for 1.00 each. It is Frozen themed and that will help me stretch my Christmas gifting abilities. So I spent 4.00 and that will be a gift for 4 of the girls in the house. 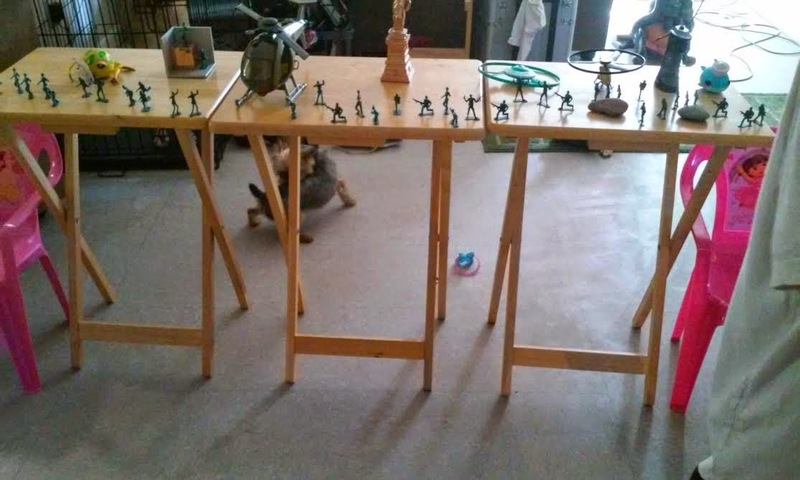 *My washer is not working quite right but my nephew had one in storage so we have a temporary solution as he has hooked his up until they find a place. *recieved a small plastic bin full of hand me downs from my bestie for my daughter. How was your week...i would love to hear about it!